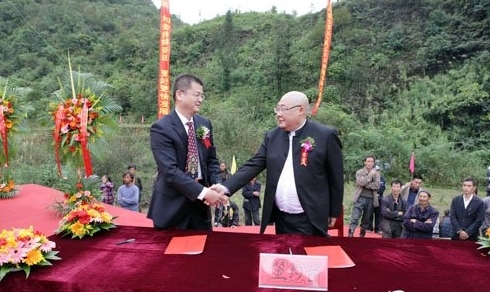 Yunnan province Guizhou Guizhou Real Estate Co. Ltd. was established in July two 00 eight years, the registered capital of thirty million yuan, three qualifications. Mainly engaged in real estate development, property management, construction land leveling. Company headquarters is located in Jinjiang District city of Chengdu Huarun Road No. 36, set up offices in the willows in Palestinian town of Bazhong city. The company has successfully developed the Li Yangxin in the willows Guizhou, Fukuzawa manor, peaceful apartment, the development of real estate, the owners have been recognized and praised, is the development of en Yang Jin Guizhou California Guizhou Jinfeng, Liu Linjin, Tu Yang Liu Jia Zui Hongyuan commercial trade center, a four Stars Hotel. Combined with the Beijing Hualian Building en Yang's first commercial center. The development of the company also did not forget to return society and participate in social charity, has to Xinglong primary school, Xinglong middle school, willows school funding for poor students more than thirty people. Until the University graduation. To the Xinglong middle school donated four hundred sets of desks and chairs, the flagpole a. With the continuous development of the company, our company will invest more funds to participate in public welfare undertakings! Guizhou Guizhou home to you, all wishes come true! Buy clothes will change because of the time, only Jin Guizhou California rare houses, and will be more bright brilliant after years of baptism, be handed down from age to age and does not change its Guanghua color! Berwick only, Jin Guizhou California Yunnan Guizhou Guizhou real estate limited to "have no predecessors" courage in the overall development of the area with 10000 square meters of land to do landscape garden, to invest 20000000 yuan investment for en Yang people carefully to create a new high quality garden apartment. Guizhou California is located in Jin Tu Yang Zhenyuan food operator station, South Ring Road, north of the Tang Balu, East, West Tu Yang bridge saddle shop, interconnected and city road. The total area covers an area of 53.3 mu, total construction area of 244000 square meters. The new building en Yang City strategic development value of new heights! Guizhou Jin California boast the world collection! Guizhou Jin California to Hua Yuan Hua Zhai broad view lead en Yang high-end humanities elegant life, the whole building with European style design, sunshine, water, plants, ring waterfall, progressive, step by step to open, to create the most harmonious family in architecture and the humanities in. In the Jin Guizhou California as if each tell you where I can and family walk, a cool breeze, where you can share with friends, with warm sunshine. Guizhou Jin California not only has beautiful environment, facilities and perfect, the construction of the bottom two storey commercial. To provide more diversified shopping place for you, Leisure Center large owners, the greatest degree enrich your leisure life. Underground garage space design of parking management system, make you more convenient freely. My company to build the leading idea of human development, the community surrounding defense system, electronic control system, visual intercom system, ensure the live life every day. The recent past, the fog color fitting. In one bright lights at the life the true regression. Bright night, elegant style of bright color from bright leisurely flash, a noble elegant, enjoy life living treasure house. Whether occupied or investment is the best choice for you. Maybe in your eyes, value, the value is the only constant rule, but in our eyes, perfect quality and quality is the hard truth! The practice of "build a project, casting a monument". Guizhou Guizhou home to the national building a construction enterprise: Guangxi Southern China Construction Group Co., Ltd. and Hainan Zhonghang Xin construction engineering company limited to build municipal excellent engineering, Chengdu University of Engineering Project Management Co. Ltd. - Specification for each link of the construction strictly control. The technical staff and construction personnel strictly, strictly the quality pass, to ensure high quality to the owner's project hand over! Now, one phase of the project is like a raging fire, everything in good order and well arranged progress, started to the owners, rigorous review your! Guizhou Jin California, the quality of real estate practitioners -- Guizhou Guizhou home in 2011, brand promotion event. Yunnan province Guizhou Guizhou Properties Limited money to hire a national Class-A design qualification, the Ministry of construction, the comprehensive strength of the National Bureau of statistics combined with national survey design unit rating of top 100 enterprises, the prestigious Fujian long Cheng group design and Research Institute of the construction industry at home and abroad, the overall planning of City complex projects willows Hongyuan Trade Center correction.